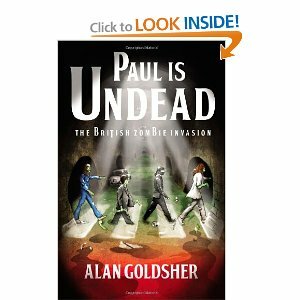 I initially wanted to read Paul is Undead because it’s about the Beatles. It didn’t hurt that the novel was also about zombies. I was not disappointed. Let me tell you, Alan Goldsher has a gold mine on his hands here. The book is written as an oral history, which is a nice change of pace. It also means something else, something much more significant you have to capture each character’s voice  so that it feels authentic and real for the reader. And Goldsher pulled it off swimmingly. The concept, the humor, the research, the writing it’s a home run. A grand slam, actually. Paul is Undead had me chuckling from beginning to end. It is an extraordinary tale of the Beatles as undead creatures, but is fascinating for the manner in which Goldsher weaves in the actual events and players from their lives and careers, adding, of course, otherworldly twists. As Goldsher’s story goes, John Lennon became a zombie shortly after he was born. Here’s how his mother tells it: I figured it was a birthmark. I did get concerned when, right after I brought him home, his skin got grayer and grayer, until it was the color of the concrete road in front of our house. After John turned Paul, Paul recounts that he and John (so John says) jammed on blues tunes for six or seven hours. That I can believe, because I remember when I woke up the next morning, both of my index fingers were lying under my pillow. In one of the author’s commentaries, he relates being stabbed by intruders at George’s home; My injuries were minimal, as I was able to retaliate with some ninja stars Iâ€™d recently been given as a gift. I’ve said it before, and I’ll say it again: Thank you, Ringo! This summer, read Paul is UndeadÂ It’s fun, it’s funny, it’s fantastic.